Christmas time calls for a little bit of movie magic – so why not head to one of these magical Xmas screenings? 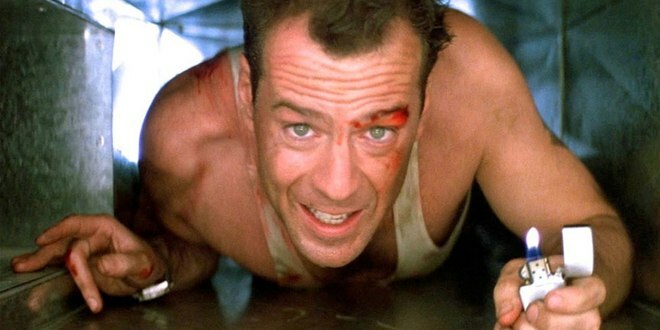 Whether your tastes are more ‘Love Actually’ or ‘Die Hard’, there’s a Christmas film out there for everyone. 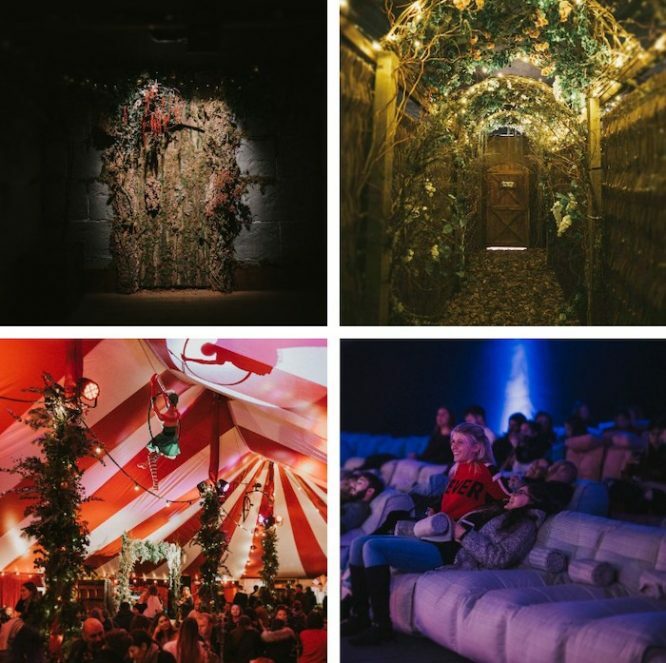 These screenings offer bean bags, blankets and cosy sofas for snuggling up on, sparkling winter decor and even mysterious mazes. Go to a cinema near you…. soon! 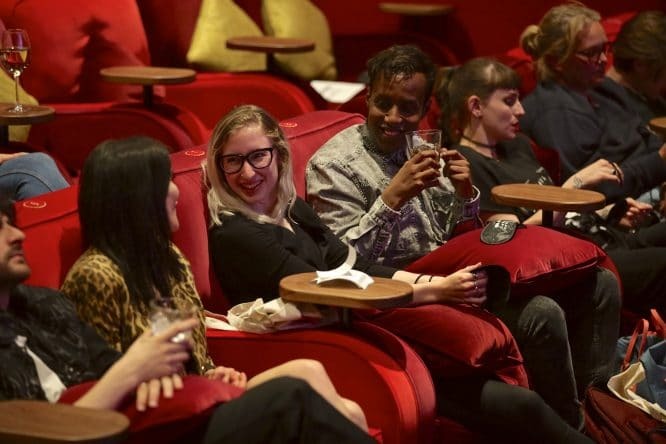 This cosy, classy new cinema has only just opened, offering comfy sofas to share and even table service to your seat! To celebrate the season, they’ll be screening Home Alone, Elf and Love Actually back-to-back, accompanied by popcorn, mince pies and prosecco. Perfect! Get tickets here. 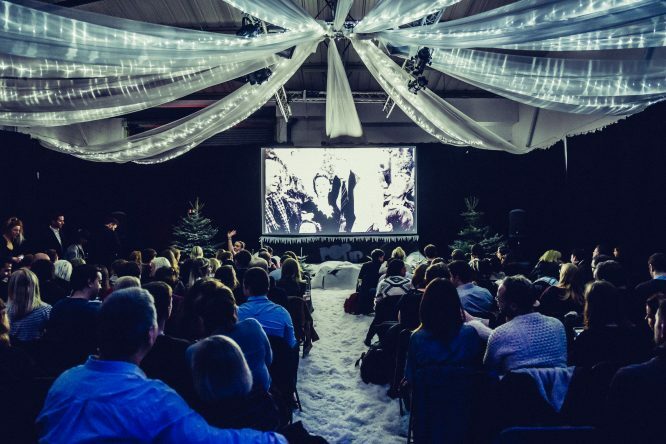 Step through a Narnia-style wardrobe into a hidden movie theatre in Hackney Downs Studios, screening Christmas classics between Dec 13 – 23. Films on offer include The Santa Clause, It’s A Wonderful Life, The Holiday and Miracle On 34th Street, along with the aforementioned. Get tickets here. This pop-up bobs up in the picturesque marina next to Tower Bridge for one week this December. 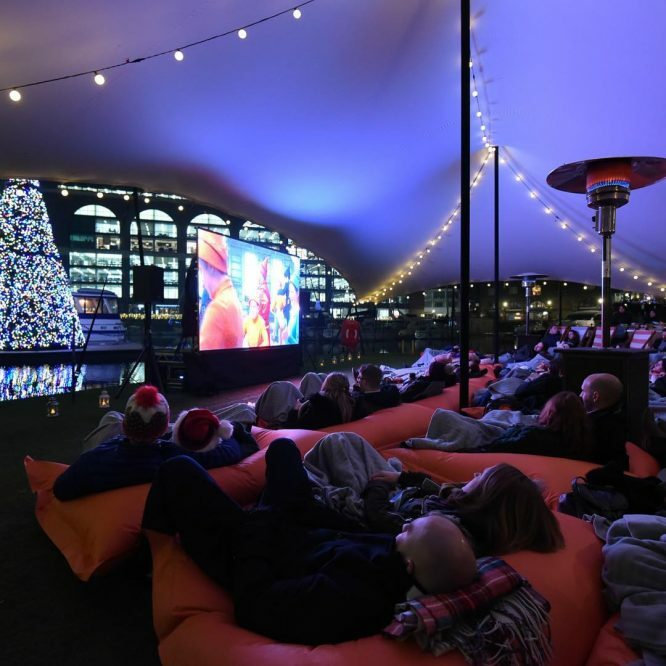 This cinematic pontoon is laden with bean bags and blankets, and will be screening all your Christmas favourites during their seven-day run. Here’s the full rundown. Everyone’s favourite indie cinema, the Prince Charles, is going all-out for the Christmas season. There are all-night Disney and Christmas pyjama party movie marathons, Elf quote-a-longs and Muppet sing-a-longs, Die Hard in 70mm and more besides, along with alt-classics like Carol, Gremlins, and Christmas Evil. See their full programme. Head to Winterville, the popular south London Christmas fair, then make your way through the Christmas Labyrinth! 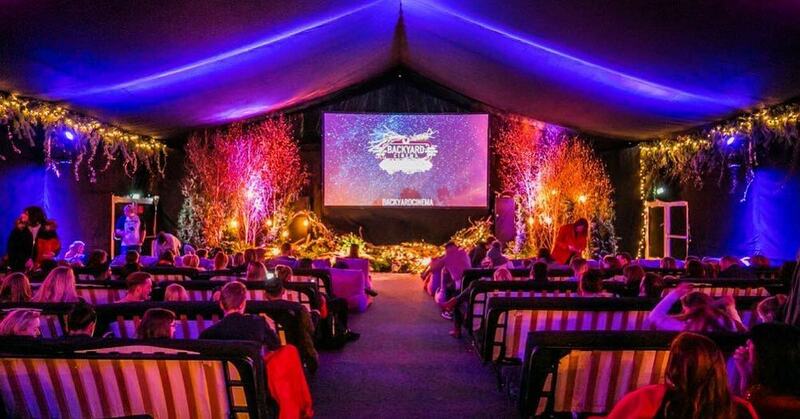 At the heart of this hedgy-headscratcher, you’ll find a gorgeous seasonal cinema presented by the Backyard Cinema team, showing all the classic movies you’d expect. See the full programme. 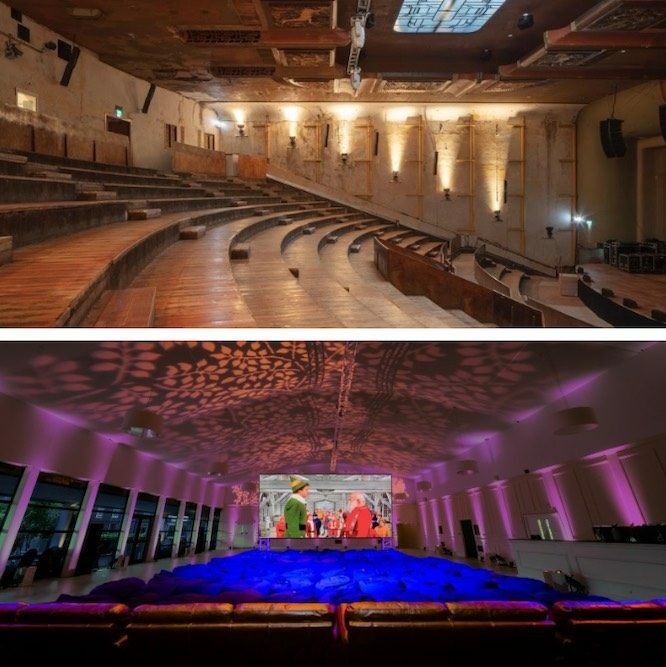 The pop-up experts from Luna Cinema take over two venues this winter: Evolutionary Arts Hackney and Kensington Palace. Both are offering a succinct line-up that, at this point in the article, really needs no further description. Find out more here. 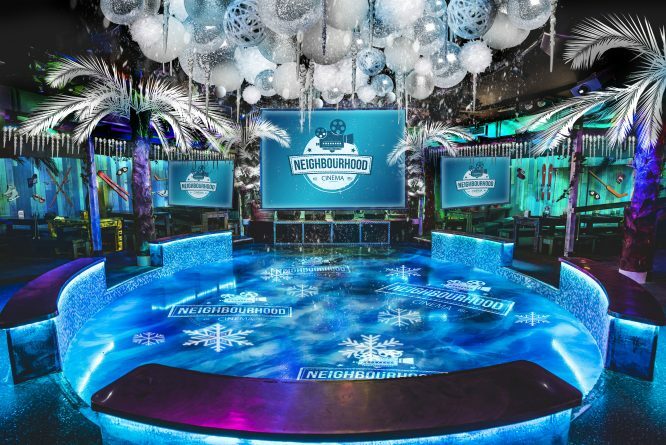 Tropical nightspot Tropicana has undergone an icy makeover for the holidays, and Neighbourhood Cinema are hosting their own set of film screenings in the venue. They’ll be showing all the usual suspects (but, note, not The Usual Suspects) along with family classics such as Cool Runnings, The Greatest Showman, Mrs. Doubtfire and Hook. See the full line-up.